1. It's been 26 years from Raise and 24 from Mezcal Head. What do you think when you listen to them now? Well first of all I don't actively listen to them. Obviously I know the songs and they sort of exist more in the head. We're very proud of them though and especially the fact that people still listen to them and want to go see them playing live a quarter of a century later. Playing them is where they come to life again and become reanimated and that's when you remember how much fun they are. Lots of musician give us props on those records. 2. I think Duel is one of the best songs. Not just yours, but generally! I sit possible for you to rate your music? I've said before that if an alien came down from another planet and asked what the band sounds like I would probably play him Duel. Beyond that though my own personal favourites tend to be b-sides or obscure album tracks that I can never get the rest of the band to play! 3. I rate I Wasn't Born to Lose You shoulder to shoulder with yor previous works. Do you have some feedback from old fans about it? Well thanks very much. We felt it was a great record and the general feedback was in accordance with yours. The day we made Autodidact available there were people freaking out and saying thanks so much and also people were saying that it was like classic Swervedriver in many ways like meeting an old friend but was also new sounding and nodding towards the future which I think is true as well. 4. You made four great albums and then everybody went his own way. What were the trigger/s for the splitting up and, after almost ten years, for a reunion? The splitting up was because we weren't having fun doing it at that time. Things just had to change and we were a bit disenchanted not only with the music scene in general but also what was going on in our own lives at the time. Certain things weren't fun any more but bands aren't supposed to last forever or be careers for life. Then time went by and things felt better again and we started having fun with it again. I was living in the US and Jimmy had been speaking with the others about doing something again and we decided to get back together. The music we made had continued to be revered in the time we had been away and we were still acquiring new fans all the time so it seemed right to bring it back. 5. Are there any news about Toshack Highway or Magnetic Morning? Not really no, although both projects have been discussed in the recent past. I think with Magnetic Morning it was great because Sam and I were neighbours and lived so close by and we could get together and write and get ideas. By the time we toured it we had a band where everyone was living in a different place - Athens, Boston, San Diego, New York, London - which was kinda crazy! Records can of course be made from distances these days very easily. I have been playing around on a Korg and getting some ideas for some electronic stuff which could be Toshack Highway ideas I guess if we wanted to bring that name back. 6. In the nineties you were in the shoegaze group with bands like Ride, My Bloody Valentine, Slowdive… None of these bands reached 00's, but they had great returns and albums after 2010's, just like you. Do you consider these cases to be related? Well I mentioned before that our star hadn't dropped in the period where we were not active and this was partly because younger kids were discovering this music called shoegaze. It sounds funny but when MySpace came out it had 'shoegaze' as a genre option on the band pages and that was a sign that this music was still very much in people's minds. You hear the influence now in film music, music on TV or in ads. Nobody really cared for the word back in the day but no-one cares anymore because it means that people discover us. 7. Did you listened to new albums from those bands and what do you think about them? There are some great tracks on all three of those albums and some great contributions from the drummers particularly. Nice to hear Loz singing on the Ride album and Simon Scott's electronica and found sounds on the Slowdive record. And we finally got to hear some of Colm and Kevin's drum and bass excursions on mbv. 8. Who is in the audience now on your gigs? Do you have a new audience who first heard of you with I Wasn't Born to Lose You album? Yep one of the great things has been seeing younger kids at the shows who probably weren't even born yet, the first time around. We played a show in Singapore and there was a bunch of girls down the front singing along to Autodidact, the first track on the latest record, which was awesome. 9. I read somewhere that there's a new album on the way. Can you tell us something about it? Indeed there is. We're in a studio in Brighton, England right now finishing off what we started in Los Angeles in October at the end of our tour there. 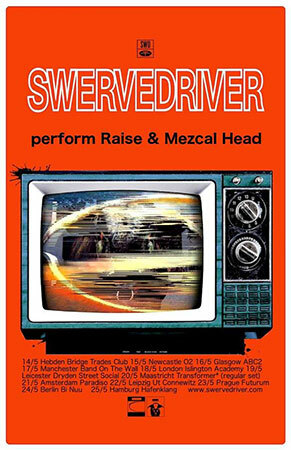 We did a Pledge campaign for this which is still live here: https://www.pledgemusic.com/projects/swervedriver. We ended up laying down thirty tracks which we had to cull down to a manageable amount and there's a great album taking shape. We're trying to hit a deadline for a autumn release date. 10. Message for the end? Thanks for the questions - see you in Prague!